As I lamented in a previous post, Texas unfortunately has a serious tiki drought. The emerging craft cocktail scene hasn’t really remedied that problem, sadly – I believe it has only made it harder for real tiki culture to be appreciated as it should be. 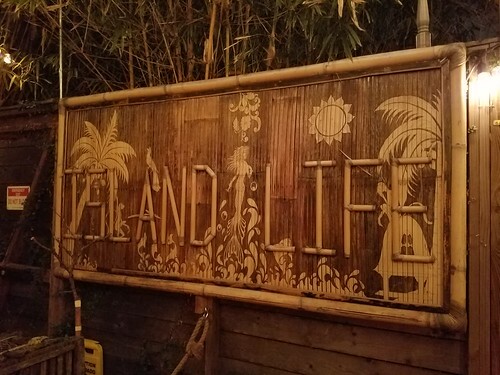 HOWEVER…in this writer’s humble opinion, there is a place in Texas that I think sets the standard for what a tiki bar should be, and that is the Lei Low Rum & Tiki Bar in Houston. Todd and I drove down to visit the Lei Low this past weekend to celebrate his birthday, and we were really amped up. 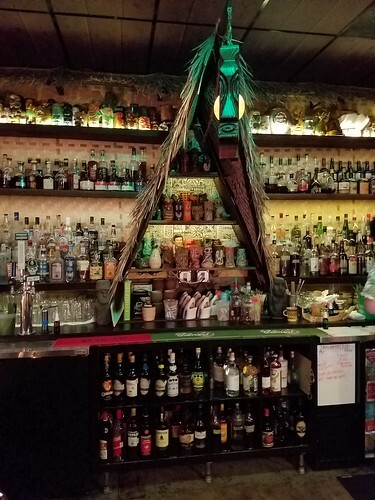 It had been a while since our last good tiki bar experience, and we were feeling the itch! After a nice dinner to get our evening started, we made our way to the bar, and Todd immediately saw why it’s so easy to miss it. 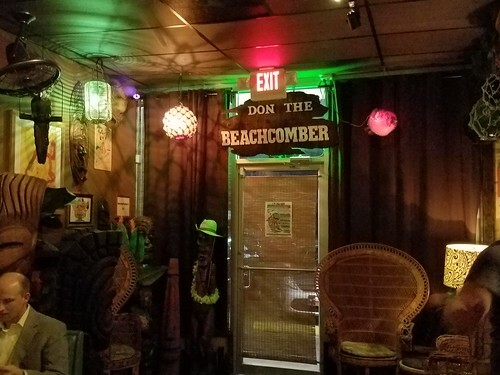 Unlike many other tiki bars, the entrance is about as plain and nondescript as you can imagine. 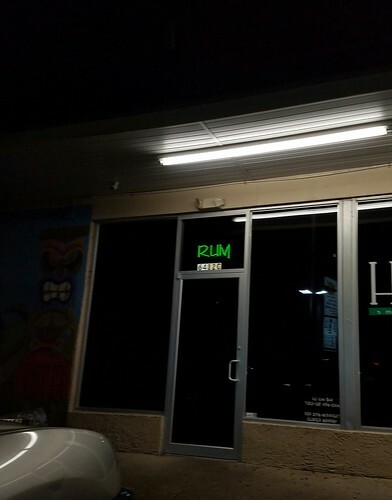 It’s right next to a smoke shop, and a convenience store, in a little strip center. 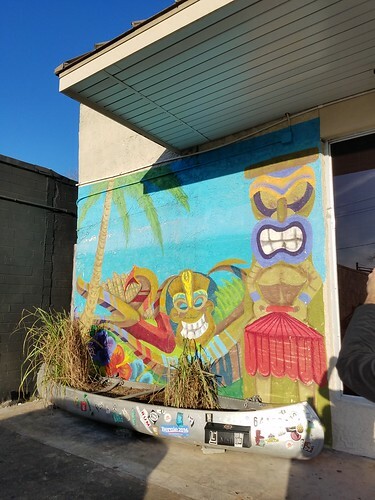 The only things you have to tell that a tiki bar is there are a small mural and canoe planter right next to the entrance, and a neon sign that only says “RUM” across the top of the door. I have to admit, I absolutely LOVE that it looks so unassuming, because when you open the door and step inside, you know you’ve landed! 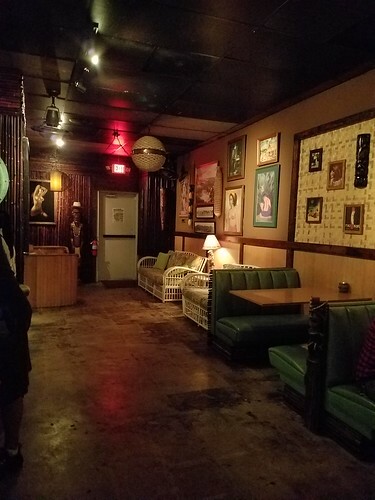 The inside of the bar is like a little oasis – there is lots of framed contemporary & vintage art everywhere, carved tikis, and amazing peacock chairs. 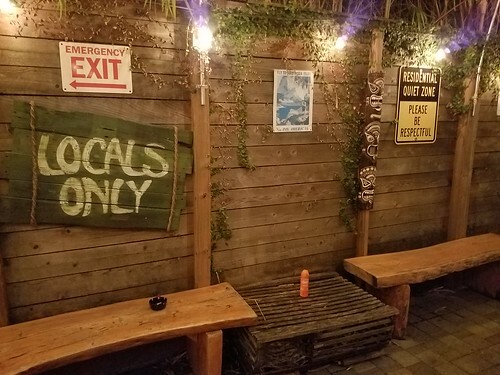 There is also a small patio outside for the smokers. The music was a mix of reggae, surf, and tiki-appropriate jazz, which was a nice variety. After walking in, we were greeted by Caitlin, and handed two menus. It didn’t take long for she and I to figure out that she’d been one of the people who waited on me the previous time I was in, which was in September of last year. It was so nice to be remembered – that doesn’t happen often, especially when you only meet someone once. Todd and I sat down at the bar, and started perusing the menu. It took a while to choose our drinks – they have a lot of options! Many of them are based of traditional recipes, but have their own “twist”. 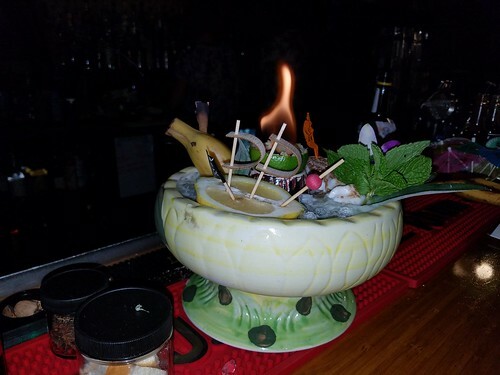 We settled on a Vic’s Mai Tai for two to start, and what we got was a work of art in a bowl. Lei Low’s garnish game is ON POINT. It was also the first time I ever had a drink with a flaming lime hull – a nice surprise! David, one of the bartenders, also worked on another bowl drink for a couple of other patrons, which caught our eyes as well. It reminded me a bit of the bowl drink garnishes at Latitude 29. 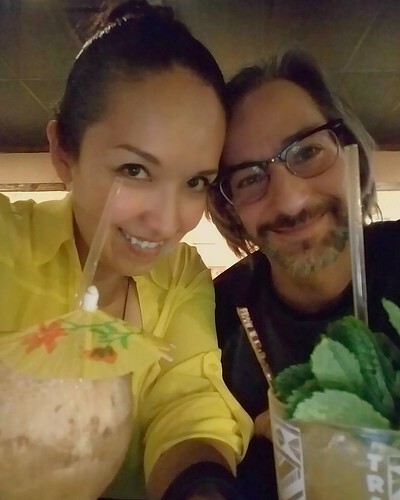 Our Mai Tai itself was delicious – normally, I am not a fan of pot still rums, but I loved its addition to this drink. It was a home run, and a perfect way to kick off the night! 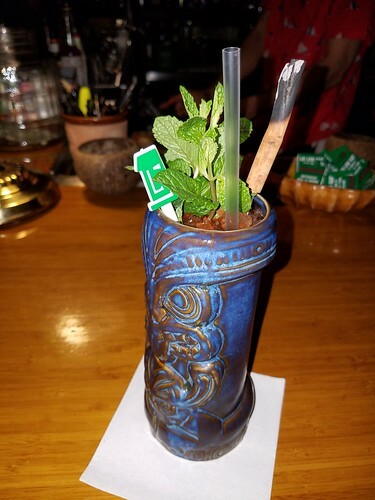 French Polynesia Bowl & Amazing Garnishes! 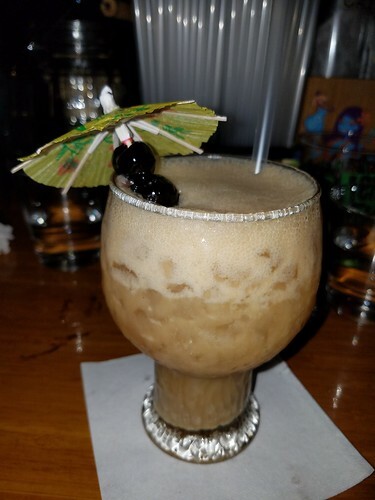 Back in December, I tasted a Ponchartrain Pearl Diver at Latitude 29, and it was my first “buttery” tiki drink. At Lei Low, I decided I wanted to try the Surf Rider, which sort of looked like a variation of the classic Pearl Diver. 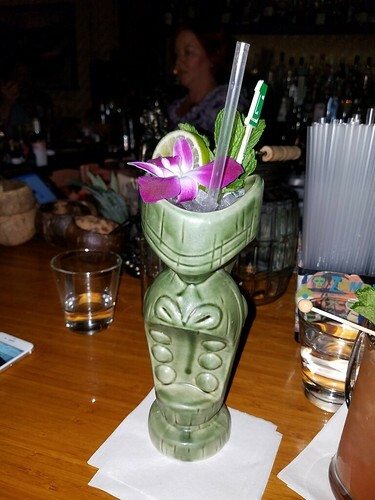 I was utterly blown away – Lei Low makes their own house “tiki butter”, which is some of the most decadent stuff I have ever put in my mouth, and it makes one hell of a drink. I savored every sip and even munched on some of the tiki butter-covered ice when I was finished. 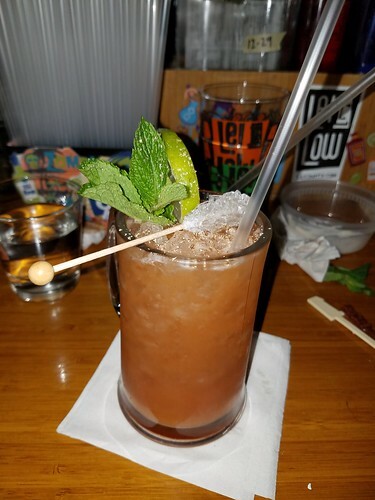 Todd opted for an off-the-menu drink, a special Trader Vic’s Mai Tai made with an exceedingly smooth blend of dark Jamaican and overproof rums. 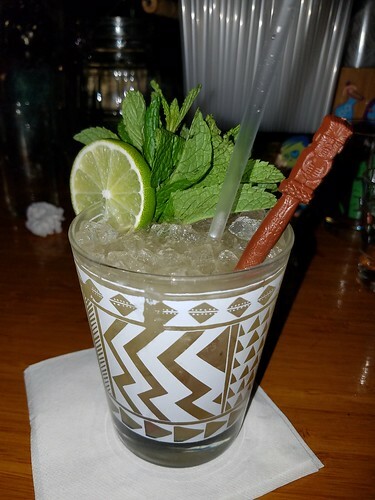 It was even served in a Trader Vic’s glass…how proper (and delicious, too)! Finally, Todd went for his favorite, the Zombie, and I chose a Navy Grog. Despite Lei Low not having Collins glasses to serve Zombies in, the mug they did put it in was appropriate, and there was plenty of drink in there (as opposed to ice). Todd was very impressed with it. My Navy Grog was served in more of a beer stein, with a rock candy stick, mint, and lime. The iconic ice cone was missing, but I am not going to balk…I bought a Navy Grog ice cone kit, and those things are not easy to make. I can’t imagine making a bunch at a time. Caitlin informed us that due to the bar’s very small size, they didn’t have the freezer space to make cones in batches. 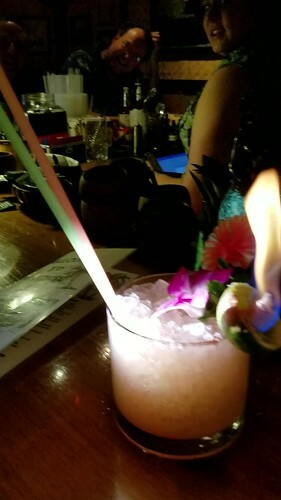 No problem…that Navy Grog was impressive, and tasted perfect (with an added guava flavor)! I feel I have to add here that we did return for another round the next night, since Howie’s Tiki was closed on Sundays. 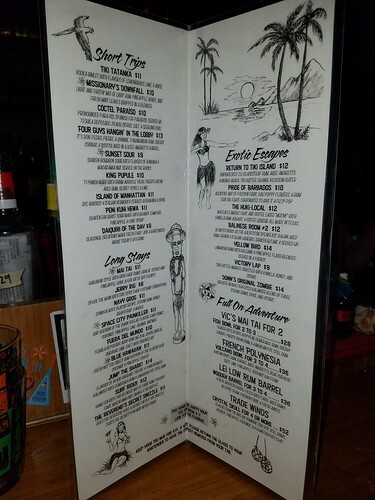 I had to have another Surf Rider, and Todd had a Donn Beach Mai Tai, but we did try two new drinks – I had a Reverend’s Secret Swizzle, a drink so top-secret, that not one single ingredient can be disclosed to you! It was more of a spice-heavy drink, which is not normally my bag, but this one was great. Todd tasted some clove in there, but he only got that far. Talk about a yummy secret! Todd went with a Jump The Shark cocktail, with black currant, cherry, Demerara, and pot still rums. 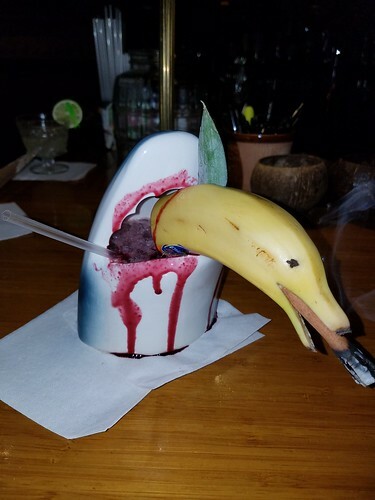 This one has one of the more kooky presentations – a bloody shark’s mouth mug, and a very unfortunate banana dolphin in its mouth, smoking a cinnamon stick. Now comes the part where I get to talk about my favorite part of our visit. Yes, the drinks were incredible, for sure, but what made everything so special was the staff. Caitlin, David, Bella, and Ben took the BEST care of us, and were only too happy to share tips, rum suggestions, and a few tiny tastes with us. We walked away feeling like we knew more than we did when we walked in, and I love that. I have always felt that what makes Tiki so awesome are the people, and these 4 people exemplify that. They were fun, attentive, and very engaging. Curiously enough, when I went to Lei Low last September to drink my sorrows away, it was these same 4 who were manning the bar. Now they are new friends – you can’t get much better than that. A huge thank you to them for a fantastic two nights of drinks and merriment – they make the Lei Low a wonderful place to be! Fantastic review!! We cant wait to go in May! Gonna be fun…thanks for the pics and the write up! You really captured so much of what makes it special. And perfect. And REALLY perfect for me, since I live less than 2 miles from it. I KNOW. I am SO LUCKY!! Did you really drive there and BACK after drinking all that booz ?? Haha… Nope. We stayed at a hotel in Houston and paced ourselves both nights. We know our tolerance levels so we were not taking chances!